Amazon Pay lets you use information stored in your Amazon account to pay and arrange delivery from tens of thousands of merchants. Checkout is quick and easy. You have no account to set up and no fees to pay. Amazon Pay makes it simple for hundreds of millions of customers around the globe to pay for products and services using the information already stored in their Amazon accounts. To make a payment, you can use any of the payment methods in your Amazon account. If you already have an account with Amazon, you only have to accept our Customer Agreement when making a purchase on a non-Amazon site that accepts Amazon Pay. There is no separate registration process. How do I find my Amazon Pay transactions? Go to pay.amazon.com and sign in as a “shopper” using your Amazon username and password. One-time purchases are shown on the “Orders” tab, and subscription agreements are on the “Merchant Agreements” tab. We do not share your full credit card, debit card, or bank account number with sites or charitable organisations that accept Amazon Pay. We share with the merchant payment information required to complete and support your transaction. This payment information may include the last four digits of your card number and the card type. It costs you nothing. Using Amazon Pay adds no fees to your transaction with sites and organisations accepting Amazon Pay. Your purchase incurs no transaction fee, no membership fee, no currency conversion fee, no foreign transaction fee, and no other fees. Your card issuer, however, may add a foreign transaction fee if your card was issued in a country different from the merchant’s as well as any other fees described in the terms and conditions for your card. Sites offering Amazon Pay ship their own orders. If you think there may be a problem with delivering your order, contact the site or organisation who should be able to address the problem. When you use Amazon Pay to check out, your purchases are covered by the Amazon A-to-z Guarantee. For a partial list of websites and charitable organisations that accept Amazon Pay, visit our Showcase page. If there are websites you frequently buy from and would like them to add Amazon Pay to their site, you can send them an email or call them with your suggestion. Amazon.com Gift Cards cannot be used as a payment method to place an order using Amazon Pay. Amazon.com Gift Cards can only be used to purchase eligible goods and services on Amazon.com and certain related sites as provided in the Amazon.co.uk Gift Card and Gift Vouchers Terms & Conditions. Find more information about Amazon Pay on our support pages. 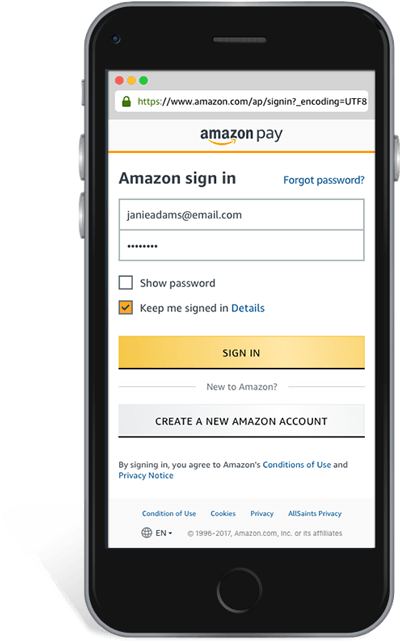 Amazon Pay makes it simple for hundreds of millions of customers around the globe to pay for products and services using the information already stored in their Amazon account.. To make a payment, you can use any of the payment methods in your Amazon account. Go to pay.amazon.com and sign in as a “shopper” using your Amazon username and password. One-time purchases are shown on the “Orders” tab, and subscription agreements are on the “Merchant Agreement” tab. We do not share your full credit card, debit card, or bank account number with merchants or charitable organizations who accept Amazon Pay. We share with the merchant payment information required to complete and support your transaction, which may include the last four digits of your card number and the card type. It costs you nothing. Using Amazon pay adds no fees to your transaction with the merchant. Your purchase incurs no transaction fee, no membership fee, no currency conversion fee, no foreign transaction fee, and no other fees. Your card issuer, however, may add a foreign transaction fee if your card was issued in a country different from the merchant’s as well as any other fees described in the terms and conditions for your card. Merchants offering Amazon Pay ship their own orders. If you think there may be a problem with delivering your order, contact the merchant who should be able to address the problem. When you use Amazon Pay to check out, your purchases are covered by Amazon’s A-to-z Guarantee. What merchants accept Amazon Pay? For a partial list of merchants that accept Amazon Pay, visit our Featured Merchants page. If there are merchants you frequently buy from and would like them to add Amazon Pay to their site, you can send them an email or call them with your suggestion. Additional information regarding Amazon Pay can be found on our support pages.